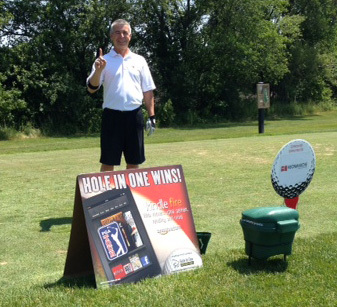 Let’s give it up for hole in one insurance winner, Bob Schrock! Schrock, who was a participant in the Mayor Dave Wood Golf Tournament at Juday Creek Golf Course in Granger, IN on May 23, 2o12, managed to score an ace on hole #11, which was measured at approximately 168 yards. The ace was made with his 4 hybrid. But wait, there’s more! Because of Hole In One International’s hole in one insurance coverage, Schrock was awarded a brand new Kindle Fire for his amazing shot… compliments of Hole In One International! That’s right: any time you purchase hole in one insurance with us, we’ll not only assist you in insuring a grand prize but also automatically include up to 4 auxiliary prizes on the non-target par 3 holes that measure at least 135 yards! Free signs too, advertising the prize(s) to be won! Congratulations again, Bob… we hope you’re getting some major use out of your Kindle! For a free, no-obligation quote on a hole in one insurance package of your own, give us a call today at 800-827-2249. You can also email us!